Freedom Seal - A New Tool to Help Businesses Fight Modern-Day Slavery. The Tronie Foundation is proud to announce the official launch of the Freedom Seal, a powerful and tangible tool to be used in the fight against human slavery. The Freedom Seal is the result of years of effort by the Tronie Foundation and its partners to put forth a specific, ongoing method for corporations to utilize to eliminate the use of human slaves in the supply chain of their products. 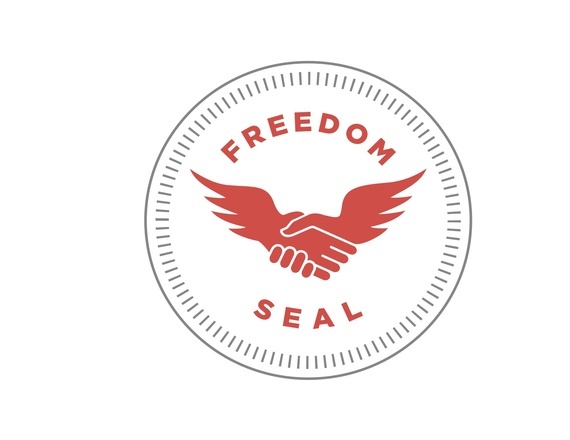 The Freedom Seal is a visual marker of "freedom" from slavery, developed in conjunction with world thought leaders, supply chains experts and with 30 major companies across Europe and North America. By displaying the Freedom Seal, businesses have a way to communicate to consumers they care about social responsibility, and are actively taking steps to prevent forced labor in their supply chains. Businesses that are interested in applying for the Freedom Seal will go through a multi-step process to meet essential criteria to qualify. The use of the Freedom Seal will then function in several ways: First, it will raise public awareness and cause people to be more aware of the social implications of their spending. Secondly, it will help consumers identify companies who support organizations that care for human trafficking survivors. Thirdly, and most critically, the application process will help businesses implement specific policies and procedures aimed at preventing forced labor. The same week the launch of the Freedom Seal took place, the Associated Press released reports of Burmese slaves working aboard cargo ships in Indonesia. They were being forced to fish under abysmal conditions, their catches then distributed around the world. This fish can find its way into local food suppliers such as Wal-mart, Sysco, Kroger, and and Safeway. When confronted with the realities of slavery in the supply chain, however many miles away they may be, corporate executives often express dismay, but take no action. They may be genuinely distressed by conditions of which they were not aware, as well as ill-informed about concrete steps they could take to prevent such travesties.